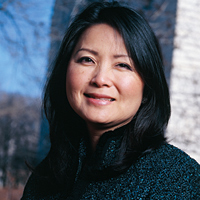 The American Dream is no myth to Sona Wang '86. At age 6, Wang emigrated from South Korea with her brother, sister and recently widowed mother to build a new life in the United States. Wang still remembers the brusque and efficient immigration officer who transcribed her difficult-to-pronounce Korean name as "Sona." Americans would find that easier to say, he told her. The moniker grew on her, and later, when Wang was naturalized as a U.S. citizen, she made it her permanent name. Adapting to life in the new country presented many challenges. With few English skills and resources, the family settled in South Central Los Angeles. Wang's mother, who had been a successful physician in South Korea, worked to re-establish her medical practice in her adopted land, while her children struggled to adapt to their new environment. Wang recalls her childhood as "the lean years," as she watched her mother learn a new language, deal with setbacks and ultimately open a successful clinic in Los Angeles. She learned powerful and enabling lessons from her mother's resilience and determination. "My mother is my role model," Wang says. "Her optimism and entrepreneurial spirit were a constant influence on our lives." In the 18 years since graduating from the Kellogg School, Wang has brought that spirit to her successful career in venture capital. In 1987, when high-tech investing was still relatively nascent in the Midwest, she co-founded the first venture capital fund in Illinois to specialize in high-technology businesses. Then, in the mid-1990s, she co-founded INROADS Capital Partners, the first venture fund in the nation to provide specialized service for women and minority entrepreneurs. The firm's name is no accident. "We wanted to send the message that this wasn't your ordinary venture capital firm," says Wang, who launched the $50 million fund in 1995. "We were established to make inroads into how our industry worked and the types of businesses and entrepreneurs that would get funded." Wang hasn't stopped there. Her commitment to expanding opportunities for women and minorities has led her back to Kellogg, where she has been a frequent guest lecturer in courses on venture capital finance and the Women in Entrepreneurship class. "My favorite quote is from Eleanor Roosevelt, who said, 'The most important thing in any relationship is not what you get but what you give.' So give, give and keep on giving." Joe Levy Jr. '47, founder and president of Levy Venture Management, Skokie, Ill.
Wang tells students studying venture capital to focus on the fundamentals when evaluating new business opportunities: the strength of the business model, the market dynamics, the competitive advantages, the barriers to entry and the skill of the managers. She cautions against overlooking intangible but critical factors such as whether the entrepreneur's goals are aligned with those of the venture capitalist. "It is especially crucial at the beginning of the relationship to agree on a common vision for the ultimate outcome of the venture," Wang says. She encourages students in the Women in Entrepreneurship class not only to develop a compelling business plan but to pursue their passion. "Paving your own road is much more difficult than following an established path," Wang says. "But the sweat equity that you invest in your idea and the risk you take today will ultimately pay off." Wang also sits on Northwestern University's Board of Trustees, where she has played key roles on committees dealing with information technology, diversity, Asian-American alumni and the university's recent $1.5 billion capital campaign. She also chairs the advisory board for the university's Center for Women Entrepreneurs in Technology. The center, funded mainly by the National Science Foundation, provides support and technical assistance to women-led innovations and entrepreneurial ventures relating to life sciences. On top of that, Wang is a member of the university's Council of 100, a group of high-profile women who have volunteered to mentor female Northwestern students and alumni. "There's a palpable culture at Northwestern, and especially at Kellogg, of striving for excellence," Wang says. "It is a place that embraces change. Some very innovative ideas are being put into practice at the school, and it's all in the pursuit of being the most excellent educational institution we can possibly be. It's very inspiring to get involved with that." Beyond Northwestern, Wang has served as chair of Springboard, a biannual venture capital forum showcasing women-led high-growth businesses. The forum has raised about $2 billion for female entrepreneurs since 2000. "Sona is the epitome of a class act and a professional," says Mary Naylor, CEO of VIPdesk, an INC. 500 company and INROADS-funded firm on whose board Wang serves. "She's always the steady voice of reason. She's very thoughtful and insightful, and because of that, what she says carries a tremendous amount of weight." Wang urges young professionals — and especially entrepreneurs — to seek mentorship and support. "Don't wait for someone to take you under their wings," she says. "Find a really big set of wings and climb under them." For many aspiring men and women at Kellogg and beyond, Wang provides the liftoff for those entrepreneurial flights.